In Veterinary Clinic. 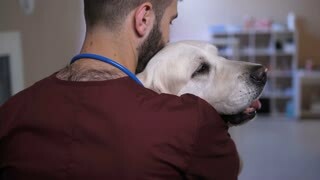 Vet Examines the Dog and Strokes the Dog. Syringes with vaccine on the background of a vet holding a dog in a veterinary clinic close up. 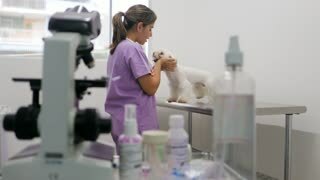 Veterinarian woman with stethoscope examining dog in veterinary clinic. Animal treatment. Unrecognized mistress stroking her dog at the reception at the veterinarian at the reception in the veterinary clinic. A vet fills a syringe with vaccine.